What started as a community member with a big heart wanting to help out with his neighbours’ pets, turned into the success that is the Mdzananda Animal Clinic, based in Khayelitsha, just outside Cape Town. Serving up to 1000 pets every month, the clinic started with only a handful of volunteers and became an animal haven over a period of 21 years. 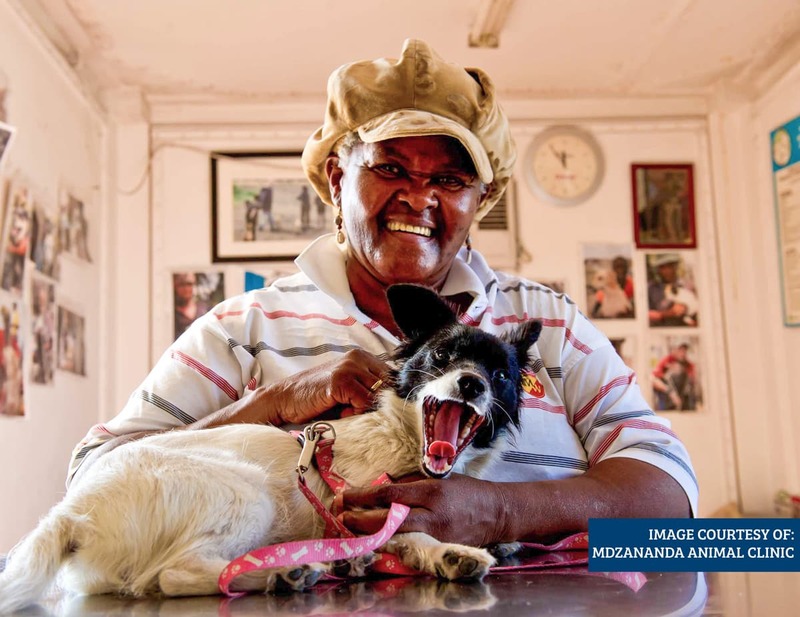 Mdzananda Animal Clinic’s story started in 1996, with a community hero who wanted to help animals in his neighbourhood. Mr Joe, a local Khayelitsha resident, took it upon himself to push a trolley and water bucket around the community, bathing and feeding community pets. He soon attracted volunteers who helped out and over time, they secured funding and the clinic grew into what it is today: a permanent, non-profit animal hospital providing primary veterinary healthcare services to the fast growing community of Khayelitsha, which never had access to such services before. The early days weren’t easy, as the volunteers – including Animal Welfare Assistants Lazola Sotyingwa and Maria Limani, and veterinarian Brian Bergman – functioned from a single donated shipping container with no running water or electricity. Today, thanks to the support of donors and funders, the clinic is a fully functioning animal hospital running six days a week. Mdzananda also has a mobile clinic that visits the community two days a week for door-to-door education, and three days a week for medical procedures, such as vaccinations and deworming, while pets that are very ill are taken back to the clinic for in-house treatment. Additionally, the animal ambulance responds to distress calls from community members in cases where animals are severely abused or neglected, or too ill or injured to make it to the clinic. Marcelle explains that they have a strong focus on community empowerment and education, and on understanding the community’s needs, embracing it, and gaining their respect and trust. Mdzananda has 22 staff members, 77% of whom are from the Khayelitsha or surrounding communities, who have all received training from the clinic’s veterinarians. “The thought of meeting new dogs, conversing with new people, challenging them with questions about animals and, most of all, saving another animal’s life, gets me up every morning,” says Animal Welfare Assistant, Lazola Sotyingwa. From the days of Mr Joe – who is now an elderly man who still visits the clinic often and loves to sit in the consultation room speaking to visitors – to what the clinic has become today, Mdzananda Animal Clinic is a place unlike any other. Its character lies in its staff and supporters who so generously give of their time and skills to contribute to the bigger picture of animal education.